The SoundEar II Noise Warning Sign can be mounted on a wall or other vertical surface using a single screw or hook - like mounting a picture. 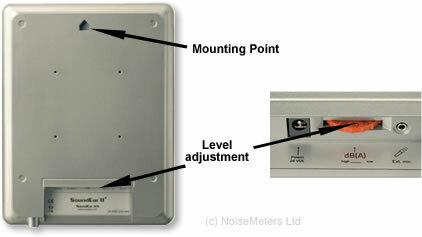 The trigger sound level is set using a dial on the back. It lights up green to show it is on and to remind people that the levels are being monitored. The yellow light comes on when the sound levels are getting high (within 5dB of the limit) and then the red light when the level is too high. The SoundEar II is made from dark gloss plastic, making it ideal for use where appearance is important, such as entertainment venues, libraries, hospitals and schools. It mounts on the wall and lights up when the sound levels are too high. The "noise" can be from any source: loud music, machinery, talking, shouting. 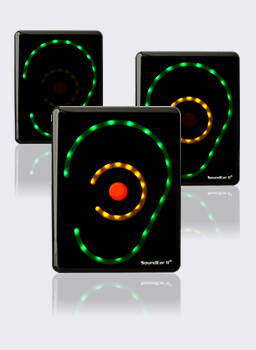 The SoundEar II is suitable for any indoor area where people need to be warned about high noise levels or reminded to keep the noise down.